Looking to start your own company but are confused about the best options? You have probably heard of an LLC and an S-Corp before – these two of the most common types of business formation. But which of these two is right for you? Making the right decision will set you up for long-term success and give you some excellent tax advantages. 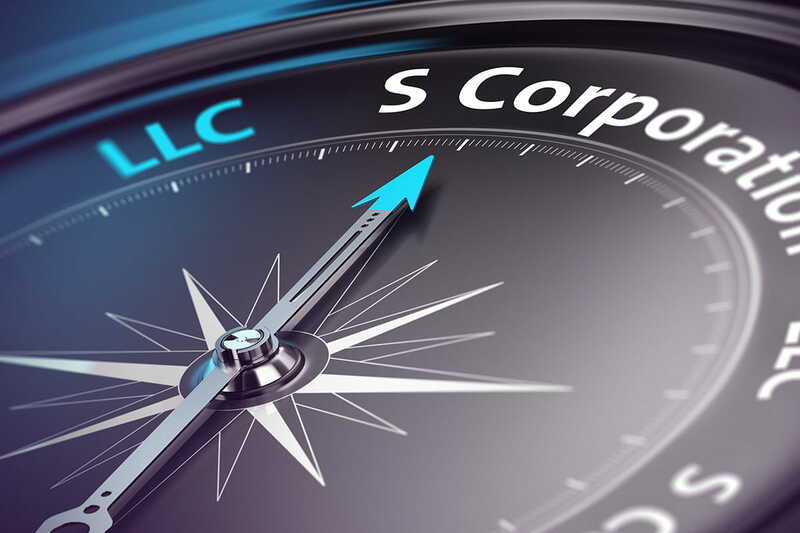 In this article we reveal the advantages and disadvantages of establishing an LLC vs. and S-Corp, and guide you through the answers to the most important questions. Let’s start with some basic definitions of LLC and S-Corp.
LLC stands for Limited Liability Company. Each state has a different definition of exactly what an LLC is, but in broad terms, it means that the business is legally separate from its owners. This protects the business owners (sometimes referred to as “members”) from any liability or debt attributed to the company (although certain special situations can negate this protection). An LLC can have one member, or it can have several members. If you are a small-business owner, you might choose an LLC because of how it simplifies your record-keeping. LLCs have far fewer reporting and record-keeping requirements than most corporations. The term S-corp refers to the way the business is being taxed, as per U.S. government tax code. While there are no limits as to how many owners an LLC can have, S corps have certain restrictions. For example, they can have no more than 100 shareholders, and they cannot be non-resident aliens. S corporations cannot be owned by an LLC, a partnership, another corporation, or a non-qualified trust. Additionally, an S corporation exists in perpetuity, meaning that even if the owner moves on or dies, the company will carry on. Probably the biggest distinction that defines an S corporation, however, is its tax status—they are not subject to double-taxation, and taxes are only filed once a year. Before we look at the differences between LLCs and S corps, there are several ways in which they are similar. Knowing this will help you understand the differences more easily. They each offer limited liability protection. This means, simply, that the owners of the business are not personally responsible for debts or liabilities incurred by the company. Instead of the onus being on the individual, it lies with the corporation (there are exceptions to this, i.e. Piercing the Corporate Veil). They are each a separate legal entity. While LLCs and S corps are governed by different regulations, they are both separate legal entities. Both LLCs and S corps are pass-through tax entities. An S corp is a pass-through tax entity. An LLC can choose whether or not to be a pass-through tax entity. This means that the business does not pay corporate taxes. All profit or loss is passed on to the shareholders/members to be reported and settled on their individual tax returns. States have their own set of statutes that govern the way LLCs and S corps are structured and run. Some of these regulations include: paying annual fees, filing periodic reports, appointing a registered agent, and informing the state of name changes or any other changes to the business, either within the formation state or when doing business in another state. Both can take advantage of new tax benefits. Thanks to the new Tax Cuts and Jobs Act (2017), both entities are now allowed a 20% deduction in qualified income from pass-through entities. This is a significant deduction for S corps and LLC shareholders and members, respectively. The main difference between an LLC and an S corp is that an LLC is a legal business entity, and an S-Corp is not. But to help you understand other important differences, we need to understand the benefits and drawbacks of both. If you don’t have time to read more, simply use our ‘help me choose entity’ free tool. An LLC is a great way to incorporate small businesses to minimize liability. An LLC provides significant advantages over a sole proprietorship or a partnership and they offer more flexibility in taxation and “looser” rules in terms of the legal/corporate formalities you need to follow. An LLC provides protection for all members of the company, from officers to members, to employees; unlike an LLP, which only protects the partners. Being an S corporation comes with many benefits. First off, all employees, officers, shareholders, and directors are fully protected from any liability. In case anything happens—whether that means mounting debt or a lawsuit against the company—all shareholders are protected (see exceptions). There is greater potential for investment as an S-corp, as revenue can be generated through the sale of shares in the company, and it easier to gain outside financing. This is another major advantage, particularly compared to C corporations. Taxes are pass-through, meaning that owners report profit and loss on their personal returns, which could save your company a great deal of money over the long-term. Additionally, taxes are paid only once a year, instead of quarterly. You must be a citizen of the United States or at the very least a permanent, legal resident to incorporate an S corp. LLCs have no such restriction. As an S corp, you are limited to only 100 shareholders. For small businesses, this may not be an issue. You must first set up a C corporation or LLC prior to becoming an S corp. There are fees and expenses associated with this process; some of which are ongoing, depending on the state of incorporation. Some states will require you to file an annual report and/or pay franchise tax fees. You will also be required to qualify on an ongoing basis. Any mistakes made, with regard to filing requirements, could result in the termination of your S corp status. Further to that, the IRS looks at S corps, perhaps more closely than, non-S corps. Payments, salaries, dividends paid to employees or shareholders are all taxed differently, which may lead to closer scrutiny. If you meet all the requirements for an S corp, most of which are fairly easy to accomplish for a small business, then you can go on to enjoy all the benefits of an S corp; pass-through taxation is probably the biggest advantage. You will need to have less than 100 shareholders. None of your shareholders can be corporations or partnerships. All your shareholders must be US citizens or legal residents of the United States. You must have only one class of stock. If these requirements are met, you should be good to go. However, you should make sure you have a good financial advisor because if any of the mandatory reports or filings are not completed, you could risk losing your S corp status completely. You would then be relegated to C corp status, which makes you subject to double-taxation. Choose your business name, if such a process is required in your state. File your articles of incorporation. Issue stock certificates to your shareholders. Obtain the appropriate licenses and permits you need to operate within your industry. Apply for an employer identification number (EIN) [Apply for EIN Now]. Apply for any other tax identification numbers required by your state and/or local government offices. You will need these for your payroll tax remittance as well as workers compensation, unemployment insurance, and so on. Within two and a half months of forming your corporation, file IRS form 2553. Obtaining S corp status for your LLC could potentially save you a lot of money as, any income tax due, is passed on to the shareholders. However, if you are a very small company (only one or two individuals), it may not be worth the expense or the trouble. Think about whether you really want to take on the extra work of managing and maintaining your S corp status—which would require you to: establish a corporate structure, hold shareholder meetings, keep records of those meetings, and in general, force you to have to deal with more than you might have time for. Additionally, if you plan to hold money within the company, you might be putting yourself at a tax disadvantage. For example, if you own 75% of the company and you made $100,000 in profits, you would be paying tax on $75,000, whether or not you received that money personally. As you can see, this can be a confusing topic choosing between LLC or S-Corp.
To make it even easier for you to decide which is best for you, we have created an easy to use ‘help me choose entity‘ free tool. It asks you some short questions and will tell you which type you should choose – in less than a few minutes. Or if you sure you know which is best for you, we would love to help. Incorporate your LLC, C Corp, or S Corp using Filenow within as little as 15 minutes, and benefit from our experts and money back guarantee.